I might not be a beauty blogger, but I've really been getting into my products recently. 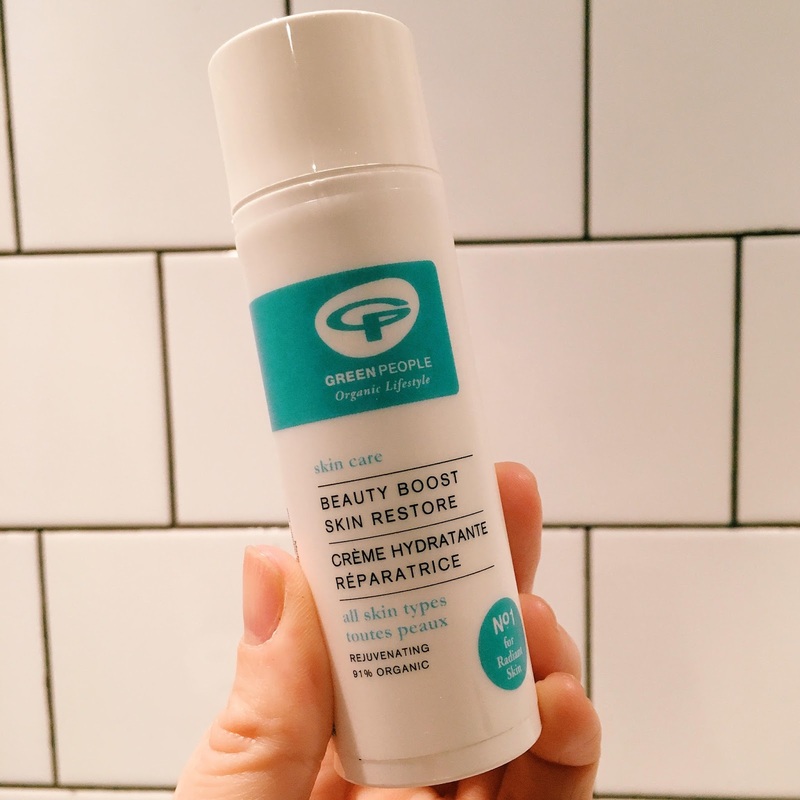 Last month some friends recommended a facial scrub and moisturiser from Green People, which I duly ordered and LOVED - and this month I was invited to join a select group of bloggers to try out a brand new product from their organic skincare range. Introducing Beauty Boost Skin Restore - a brilliant, fuss free, weekly treatment which I think is pretty darn perfect for busy women that don't have much time to indulge in a spot of pampering on a regular basis. It's a leave on treatment with all the benefits of a nourishing clay face mask - but without the wait while it works its magic, and without the messy clean up at the end! It contains green marine macro algae, which hydrates the skin and has a smoothing and plumping effect on it, everlasting flower extract, which is rich in antioxidants and neutralises free radicals which means the skin is less likely to show signs of ageing and wakame, which increases oxygen consumption within the skin cells and stimulates the production of collagen, one of the key factors in maintaining skin firmness and flexibility. It left my skin looking really bright and smooth, and feeling extra moisturised without any of the tightness I often feel after using a face mask. In fact, since replacing my old skincare products with Green People ones over the past six weeks I've actually stopped wearing foundation altogether. My new regime involves using the fruit facial scrub and Vita Min Fix 24hr moisturiser every evening, splashing my face with water every morning and then treating myself to a beauty boost treatment once a week (or twice, if I feel I need an extra pick me up). I've never been that fussed about fancy skincare products before, but now I'm seriously addicted! The Beauty Boost Skin Restore costs £18.50 and is available to pre-order from the Green People website here from today, with a 10% discount up until it's official launch date of 31st March. I was sent a complimentary bottle in exchange for this honest review.